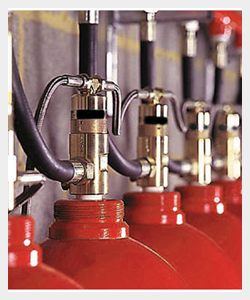 Fire suppression systems are an automatic way to detect and extinguish a potential fire, even before it has a chance to take hold and damage the equipment, it is designed to protect, by way of fire or smoke. These fire suppression systems are usually fitted in data or archive rooms but also have other applications as well. At IFS we are aware that most business central hub of communication, operations and information storage is your computer data centre. The importance of protecting such an important storage facility is paramount, with the provision of a correctly designed, installed, commissioned and certified fire suppression system you have the knowledge and peace of mind that what you value most is protected form the possibility of fire damage. We offer a fully tailored service to businesses and organizations alike, from design, installation and through to certification, all with a full warranty for extra peace of mind. We offer before and after sales advice direct to both contractors and end users alike. IFS can manage every aspect of your fire suppression installation, from free and impartial advice when chosen what product best suits your requirements, from the installation and all the way through to service & maintenance of the equipment installed. One of our key selling products is FM-200 is the most widely used; it provides a rapid suppression with a short discharge time of typically six to ten seconds. It is electrically non-conductive with a relatively small cylinder storage footprint, it is ideally suited to use in areas where space is at a premium or weight restrictions apply. Effective on class A, B or C fires FM-200 extinguishes fires quickly through a combination of chemical interaction and physical heat removal so that combustion cannot be sustained. The device does not smother flames but removes heat from fire and not oxygen from the environment. FM-200 absorbs heat from the flame zone and interrupts the propagation of the combustion process. IFS are Fgas registered and all staff have carried out the required training when it comes to handling, transporting and disposing of Fgases.